Hey, Guys and Gals! It’s Marissa from Team Smiley! 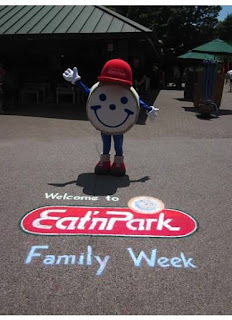 This past weekend, Smiley and the gang hit the road and traveled to the Pittsburgh Zoo and PPG Aquarium for Eat’n Park Family Week. There were many wonderful people and eager cookie lovers in attendance. Over the course of two days, the team passed out a whopping 4,800 decorated cookies! We even made sure to give a few extra to the talented artist who made this beautiful chalk drawing of the Eat’n Park logo. On Saturday, we had the perfect spot by the aquarium where we could watch excited kids interact with both the aquatic animals and Smiley! It was a special treat when we were visited by a massive sea turtle that looked like Crush from Finding Nemo. 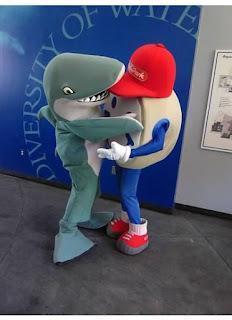 Even though we couldn’t swim with the real fish, Smiley made a new friend with the zoo’s mascot, Sharkey! Their playful encounters had the kids and families inside the aquarium roaring with laughter! All in all, Team Smiley had a fun filled weekend. Stay tuned for more exciting stories from Smiley’s adventures and click here to see where he’ll be visiting next!